This January, as we start the year with inspirations, pledges and promises, we would like to introduce two very inspiring women who are now a part of the billionBricks family. 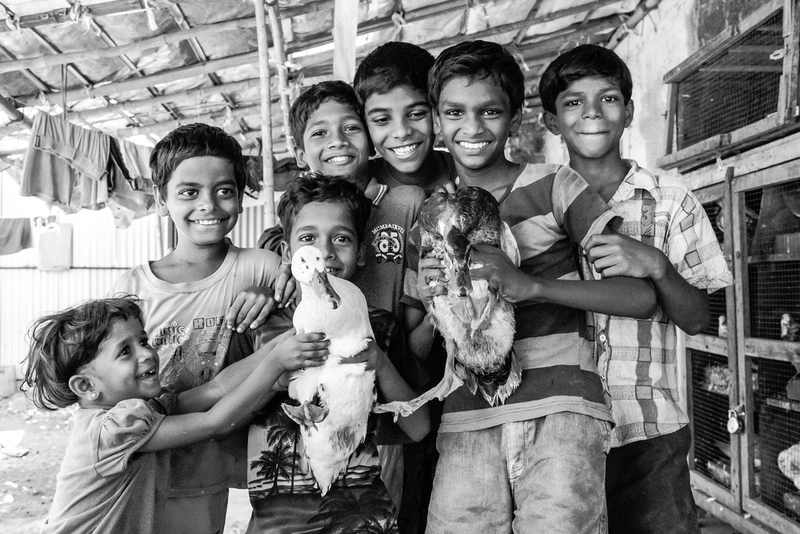 Last year, Palita joined billionBRICKS and her amazing photographs of the Mumbai slums have narrated many heart warming stories to audiences across the world. Oormila, a talented painter, traveller and musician is also an excellent storyteller as her paintbrush spins tales from her memory and imagination, both shaped by her life's varied experiences. Let us get to know them a bit more. Here is an excerpt from my conversation with Palita. 1. bB: What motivates you to be associated with billion Bricks (bB)? Palita: "If you can't feed a hundred people, then just feed one." ~ Mother Teresa. My parents have always instilled in me the importance of giving back to the society since I was a child, so it has always been my goal to make a positive impact while I build my photography business. I've been donating my time and my skills as a photographer to non-profit organisations such as Save Our Street Dogs (SOSD) and The Society for the Prevention of Cruelty to Animals (SPCA) by helping them tell their story through photographs. I discovered billionBricks via a friend and was subsequently introduced to Prasoon. I was really inspired by his vision and commitment, and I knew instantly that I wanted to be part of the movement and contribute the best I can to such a worthy cause. 2. bB: Please share with us your experience while photographing in Mumbai for bB ? Palita: I was travelling in Mumbai, Delhi and Shimla in June, so I reached out to Prasoon before the trip and told him I would like to see bB's work on the ground first hand, and most importantly, if there is anything I can do to help out while I am there. He said they needed someone to help document the lives of the residents in slum settlements and I jumped at the opportunity. After all, there is no better way to learn about a place, than to experience it. When one thinks of a slum, one has this stereotypical view of it as a den of hopelessness, crime and extreme poverty (I was guilty of that as well myself !). Little did I know, that my visits to the slum settlements at Bandra and Shivaji Nagar would completely shatter the stereotype and become the most memorable and inspiring part of my trip to India. Bandra and Shivaji Nagar slum settlements are not as well known as the Dharavi, which provided the setting for the blockbuster movie Slumdog Millionaire. However, they are still challenged by immense issues, from affordable and safe housing, sanitation, decent work opportunities and even basic health care. The poverty was hugely evident wherever I went, but I was always greeted with smiles and generousity. People are genuine, kindhearted and welcomed us into their homes wholeheartedly and talked candidly about their lives. And nothing beat the smiles and laughter of the children. They always get a thrill from being photographed, and they would then crowd around the camera to inspect the images before dashing back into position, squealing with pleasure, to pose again and again. You get the sense that despite the odds and conditions, the people who live within the slums are not just defined by its chaos and poverty. They remain hopeful, optimistic and committed to improving the quality of their lives. These extraordinary family and people have etched into my memory. I know the lessons I learnt while capturing candid moments in the slum settlements are lessons for life. Each walk down those narrow alleyways, each family visit, will hold me in good stead in the future, and by that I'm not just referring to photography. My hope is that the images would become a catalyst, an inspiration, to motivate people to learn more, and to move them into action, no matter how big or small their contribution is. 3. bB: Would you like to tell us any particular story that touched your heart while working with bB? (1) Our guide at Shivaji Nagar slum settlement is an incredibly bright, hardworking and a very well-educated man in his early 20s who grew up within the slum itself. Despite his great qualifications and achievements, he struggled to get a job because as soon as the employers found out that he lives in the slums, they would turn him down with various excuses. He was told by one of the employers that they can't offer him a job because he doesn't speak English, when English isn't required in the role in the first place.Hearing his story disheartened me. The world "slum" still carries negative connotations to many people, even to the local community in India. And it is more important than ever to educate people and change one's perspective of the slums. People who live in slums already have a steeper hill to climb to begin with, to add on the stigma of being a "slum dweller" and discriminated by the society is further diminishing the residents' prospects even though they are committed and work very hard to carve a better life for themselves and their family. It will take time for people to change their views, but I'm glad there are NGOs like bB who have started the ball rolling and working tirelessly on educating the public. (2) A large portion of goods in India are produced in the slums. One of the families we visited earn their living through packaging socks into pairs for retail purposes.The factory would drop off massive unsorted piles of socks that are inside out, which would fill up their living area. And the whole family, would spent the whole day sorting through the socks by cutting the thread ends, turning them inside out and arrange them in pairs then put them in little plastic containers with labels and sell them back to companies to be distributed to various retail stores for very little pay. Witnessing this first hand gave me a completely different perspective when I go into clothing shops now. Despite the circumstances, the father and mother of the family said to us "The only reason we want to leave the slums is to give our children a better future. If we don't have children, we are actually happy to live here. Our parents grew up in the same house and we have made a lot of great memories here. We have a close-knitted community here which you won't get if you are moved to better housing solutions. Plus, nothing compare to the amazing atmosphere and vibe within the slums during the festivities. Our families who left the slums would always return to the slums and celebrate the festive seasons with us." 4. bB: We would love to know more about you. What is one interesting/ fun fact about you, which you would like to share with the readers? Oh, I'm also a big fan of sun dried tomato and tomato soup, yet I find fresh tomatoes absolutely repulsive. You should see the puzzled looks behind the food counter whenever I ask for a tomato soup and a wrap with no fresh tomatoes. 5. bB: If you were not a photographer what would you be doing instead? We wish Palita good luck for her future endeavours and hope to catch her in person soon. 1. bB: What motivates you to be associated with billion Bricks(bB) ? Oormila: When I read about Billion Bricks and the work they do, I was fascinated by the minds behind it. Here were a team of architects and professionals investing their time and abilities towards a worthy and noble cause. I was raised by parents who instilled in me, a sense of social responsibility- that it was important to give back to society, to think beyond oneself and to use one's talents for the greater good whenever possible. I wanted to use my gift, to contribute in my own small way, to the work that bB does. 2. bB: Please tell us about your inspiration behind your work for bB. Oormila: It was truly inspiring to know about bB’s vision to give homeless people a chance at bettering their circumstances and giving their children a shot at education. I too could relate to what homelessness means firsthand, - in 1991 during the Iraqi invasion of Kuwait (which I consider home) I, along with thousands of others spent many months in the war zone, several weeks of which were spent homeless in Iraq and Jordan. I know what it is like to be displaced, to feel terror, fear, anxiety, and complete uncertainty about the future. I was 13 at the time. The series has 6 paintings, each 12”X12”. The paintings represent sanctuary, stability, refuge and belonging. 3. bB: So far, do you have any favourites from what you have painted for bB? Oormila: The first painting is titled “Repose” and depicts a father cradling a swaddled infant. When I was about 5, I came to India on a holiday. My father is from a rural fishing village, in Alleppey. Attached to a government school near out house, was a large shed, the equivalent of a village kitchen, that gave free breakfast to poor children. My cousin and I wanted to know what it was like to eat there and my parents were happy to take us. I remember eating upma with sugar and bananas, that morning. The lady who served us food, was very amused to see us sitting cross legged with the local children. In the hut behind her, a man sat smiling at us. He was holding a sleeping infant. In spite of their humble circumstances, there was an atmosphere of contentment around them. This painting is based on that memory. Oormila: I always carry an umbrella, in both rain and shine! So if you catch me anytime between sunrise and sundown, I will have my umbrella up. It is like a natural extension of my anatomy. I call it being sun-smart. My friends think it is eccentric. But hey, eccentric is totally acceptable for an artist, right? I started learning the piano in my hometown in Kuwait, when I was very young. We could never afford to buy one though, and I practiced mostly at my teacher’s house. For ten years, my father saved up and finally on my 13th birthday, he bought me a beautiful Kawai upright. For its time, it was top of the line. Exactly a week later on August 2nd, 1990, Iraqi forces invaded Kuwait. After being trapped in the country for two months, we left with just the clothes on our backs, across the refugee trail and camps from Basra to Baghdad before being sent to camps in Jordan where we awaited deportation. In December, we finally reached India and a few weeks later, Operation Desert storm was in full swing. I watched the allied forces carpet bombing Kuwait on TV, and wondered about the fate of my piano, a gift I had waited so many years for. It was nothing short of a miracle. Everything was there the way we had left it. The piano was there, without a scratch, perfectly safe! 5. bB: If you were not an artist / painter what would you be doinginstead? Oormila: I would be a street musician! I am moving to Melbourne in April and I have already bookmarked 26 locations in the city with street pianos. No points for guessing where you’ll find me in my free time!